Any word on why Schulte has not been playing? I heard that it was a minor injury of some sort to her leg...Not sure if ankle or knee, but supposedly she will be good to go for next weekend. My question is: does she fit anywhere? I don't see where she gets AB's. 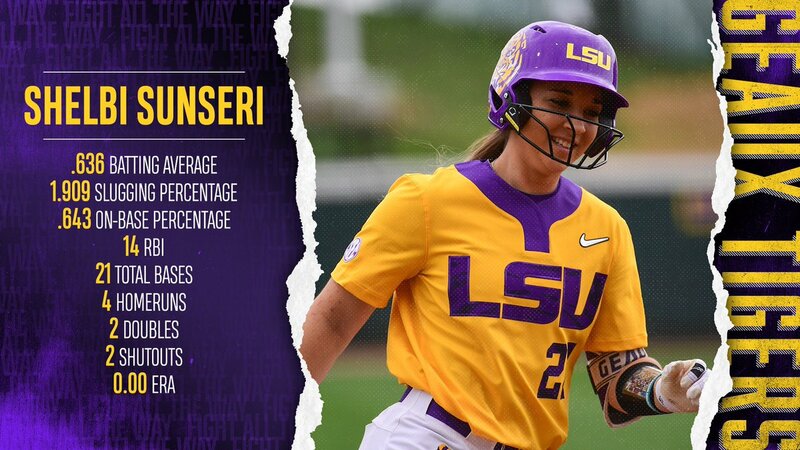 I could see her as a defensive replacement at 2nd late in games, but it's not like Shemiah is weak at 2nd. I’ll be honest, Schulte will not see many reps this year as Shemiah Is over at 2B. Bourg is there as well. Both hit significantly better at the plate on top of it. As the commentators said during one of the games this weekend, she will be hard pressed to see much time unless her bat improves. Her bat was very bad last year. I think Beth realizes having offense is crucial and she made it clear during the fall and spring that you will now need to hit to find room in this lineup. Schulte is a great kid, hardworking and a great teammate. Beth will find her some time during some of the midweek games but she won’t ever be used really for these SEC games and post season aspirations. Unless a miracle happens with her bat. Schulte has a lot of power. She can put the ball out. Shemiah can too. Bourg is a contact hitter and she can bunt better than most of the girls, if not all. Serrett bunts very well, too. Hitting mechanics always rear their ugly head. Most of the times, a hitter with bad mechanics doesnt get through a season without being exposed. Schulte's launch angle is more suitable for golf. The bat dumps from the get-go. If she can get that straightened out, she will be fine. You can see when she hits the ball squarely, she hits really hard. On the defensive side, she looks like she was bred for second base, throwing at angles that middle infielders throw at. Shemiah is more a third baseman in terms of throwing the ball. Bourg and Schulte throw more second baseman/shortstop angles. Glad to know Schulte is not serious hurt, or academically ineligible. Hope she has a good senior year. #5 Florida played some very good teams and went 5-0. #6 Arizona went 3-2 losing to #5 Florida and North Carolina State. #9 South Carolina went 3-2 losing to #19 Baylor and North Carolina. #10 LSU kicked arse !!! #21 Oklahoma State who LSU plays Thursday morning went 4-1 losing to UR Illinois and beating #15 Kentucky. @ Kajikawa Classic in Tempe, Ariz.
@ Friends of Jaclyn Tournament in Orlando, Fla. Host of Joanne Graf Classic in Tallahassee, Fla.
Absolute bull shite that Sunseri wasn't player of the week. .636 average with 4 homers, 14 RBI, and 2 doubles, 7 total hits. 636 average with 4 homers, 14 RBI, and 2 doubles, 7 total hits. She was also 2-0 in the circle with a 0.00 earned run average in 10 innings. She allowed five hits and struck out nine against 35 batters. Sunseri should be player of week. Amanda Sanchez had a great week as well. They normally keep "player of the week" and "pitcher of the week" separate, which I get. But Sunseri's hitting alone should have been enough. My guess is they didn't want to give 2 awards to LSU players.